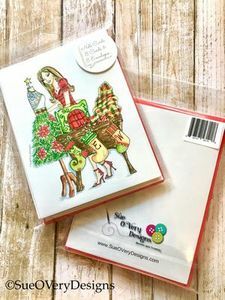 Sewing enthusiast tend to be a giving crowd and these note cards will make the perfect gift for your stitching friends. Our stitching gal has dazzled up her sewing room with a dress form decorated like a sophisticated Christmas tree, hung stockings her sewing table, monogrammed of course, with the letters S E W, stitching a last minute gift and of course looks fabulous doing it all. These blank Sew Christmas note cards are 4 1/4" x 5 1/2" finished size and come with a matching Christmas Red envelope. Available as a pack of 8 so you can send one to each of your stitching friends.